Microsoft's browsers last month staved off decline for the first time since June, managing to hold on to their share of the market even as Mozilla watched more users desert Firefox. According to U.S. analytics vendor Net Applications, Internet Explorer's and Edge's share rallied in November, increasing by one-tenth of a percentage point to close the month at 13.9%. The boost to Microsoft's browser fortunes came entirely from the if-not-obsolete-then-certainly-creaky IE, which scratched back to 9.6%. Edge, the default for Windows 10 and the browser Microsoft has pinned hopes to, remained flat at 4.2%, the same ground it occupied in October. The rise of IE was ironic, since Microsoft long ago demoted the browser, saying it was suitable only for the soon-to-be-retired Windows 7 and for Windows 10, as a legacy stop-gap. Microsoft stopped improving or enhancing the browser, specifically IE11, in early 2016. Since then, the Redmond, Wash. company has only serviced the browser with security updates. Net Applications calculates user share by detecting the agent strings of the browsers people run to reach the websites of Net Applications' clients. The firm then tallies the visitor sessions rather than count users, as it once did. In plainer terms, Net Applications' data represents user activity. Microsoft's browsers may have kept heads above water in November, but their past performance signals that the effort will be short lived. Since January 2015, IE's and Edge's increases have been brief: no longer than two consecutive months. Three of the four post-2015 periods of increases have been but a single month, with declines returning the next. The only plus for Microsoft is that in the last 12 months, five have seen increases (including November's). That's the most positive 12-month stretch since 2013, when IE recovered some share from a years'-long downturn. The 5-in-12 may hint that Microsoft's browsers may be ready to stabilize, rather than disappear entirely. However, the latter remains a distinct possibility. Even with the five months' of increases, IE + Edge shed 2.4 percentage points in the last 12 and 2.2 points in just the last six months. And at the current average monthly movement, Microsoft's browsers will slip under 13% in March and fall below 12% in August 2019. A year from now, the browsers could be in the psychologically-dangerous 10% range. Net Applications pegged Firefox's user share at 8.96% for November, a three-tenths of a percentage point decline from October. It was the first time that the open-source browser ended the month with less than 9% since May 2016, during a stretch when Firefox flirted with disaster. Computerworld's forecast - calculated using Firefox's 12-month average - now puts the browser below 8% in March and beneath the 7% comatose bar by August. Firefox has been near death, and recovered, before: In mid-2016, the browser plummeted to 7.7%, yet by year's end had climbed back to 12.2%. But this latest string of user desertions must concern Mozilla: Firefox has been under 10% for six out of the last seven months. That's not happened since the browser was on the upswing in late 2005 and early 2006. Elsewhere in the November data, Google's Chrome lost nine-tenths of a percentage point, ending the month at 65.6%. The loss was Chrome's largest one-month drop since August 2013. It's unclear whether the substantial decline forecasts that Chrome's explosive growth is nearing an end. (Chrome gained an astounding 24.1 points of user share in 2016, for example.) Past dips have been temporary, for one thing; for another, Chrome is still up five percentage points over the last 12 months. Computerworld's forecast remains rosy for Google's browser: Using the 12-month average, Chrome should crack the two-thirds mark in January and reach 68% in April. 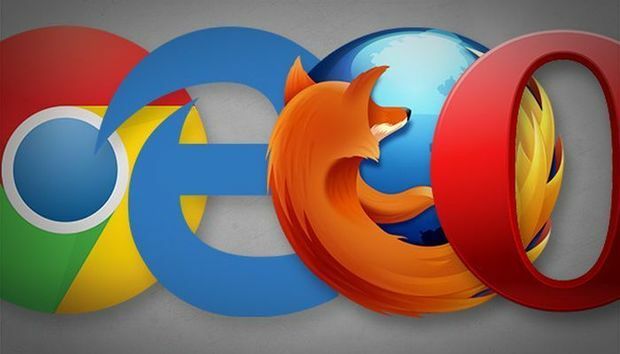 Microsoft's browsers last month continued to slouch toward invisibility as the combined user share of Internet Explorer (IE) and Edge fell to yet another record low. According to California-based analytics company Net Applications, IE's and Edge's share dropped by a quarter of a percentage point in October, ending at 13.8%, a record for the century and a number not seen by Microsoft since IE first took on Netscape Navigator in the 1990s. Net Applications calculates user share by detecting the agent strings of the browsers people run to reach clients' websites. The firm then tallies the visitor sessions - site visits, essentially, with multiple sessions possible daily - rather than count users, as it once did. In plainer terms, Net Applications' data represents browser user activity. What's happening to IE and Edge? Microsoft's browsers have been trapped in a repetitive story of decline, decline and more decline. After years of dominance, IE started its free fall after Microsoft announced that Windows users would be forced to upgrade to the latest version. Since then, IE has lost 84% of the user share it owned in August 2014, when the company delivered the upgrade-or-else ultimatum. Those losses accelerated in the months after January 2016, when the requirement began to be enforced. There have been only the most fleeting of signals that the decline of IE, or even IE + Edge, will stop. Any pause in the downward trip has been fleeting - at most, two months - and always immediately followed by losses that erase the upswing. At the current average monthly loss, IE + Edge will slip under 13% in December, drop below 12% in February 2019 and fall beneath 11% in April. The browsers could breach the psychological barrier of 10% by June. Pin the blame on IE: In the last four months, IE has lost an estimated 45.6 million users. That's significantly more users than ran Apple's Safari browser last month (about 37.5 million). IE's decay should come as no surprise, least of all to Microsoft. IE11, which accounted for about 84% of all versions run in October, was demoted to legacy status in January 2016. At that time, Microsoft stopped all IE development, saying it would service the browser with security fixes only. IE11 is akin to an amber-trapped bug from the Cretaceous period; it hasn't changed, even though competitors like Chrome and Firefox have furiously added features and functionality. Meanwhile, Edge has been unable to capitalize on the decline of IE. Windows 10 users, the only ones who can run the browser, have rejected Edge. Over the last four months, as IE shed three full percentage points of user share, Edge's needle moved an almost-imperceptible three-hundredths of one percent. Just 11% of all Windows 10 users ran Edge in October. Net Applications said Firefox's user share slid another four-tenths of a percentage point in October. The open-source browser ended the month with a 9.3% share, its lowest mark in more than two years. Computerworld's forecast - calculated using Firefox's 12-month average - now puts the browser below 9% sometime this month, under 8% in February and beneath a barely-breathing 7% come May. Firefox has clawed back from the abyss before - in the summer of 2016, the browser slumped to just 7.7%, but came out of that trough - so no one should write it off. But the prolonged user share funk certainly warrants thought of at least a minor freak-out: Firefox has been under 10% for four straight months and five out of the last six. Later this month, Mozilla will celebrate the one-year anniversary of the release of Quantum, a major revamp of Firefox's UI (user interface) and the debut of a new rendering engine that dramatically boosted page load speeds. Net Applications' numbers, however, show that Quantum failed to arrest the user share slide. Elsewhere in the October data, Google's Chrome added approximately two-tenths of a percentage point to its already-massive share, closing out the month with 66.4%, just a bit shy of the two-thirds milestone. Chrome's climb has not slowed: Its 6-month average increase was more than half again as large as the 12-month average. Using the latter as a guide, the browser could crack the 70% mark by May. Only Microsoft's Internet Explorer and Netscape's Navigator have been that dominant. Apple's Safari gained two-tenths of a percentage point, reaching 3.7%, its highest since April. But during October, only 37.6% of all Mac owners ran Safari. Like Windows users, they have largely dispensed with their operating system's default in favor of a cross-platform alternative such as Chrome or Firefox. Microsoft's tired Internet Explorer (IE) last month slumped below 10% for the first time, dragging down the company's total browser user share to a record low. According to California analytics vendor Net Applications, IE's user share plummeted by nine-tenths of a percentage point in September, falling to 9.94%. The bulk of that - approximately 83% - was accounted for by IE 11, the final version of the 23-year-old browser. It's IE 11 that is run in Windows 7 and Windows 10; the browser is relegated to legacy status on the latter. 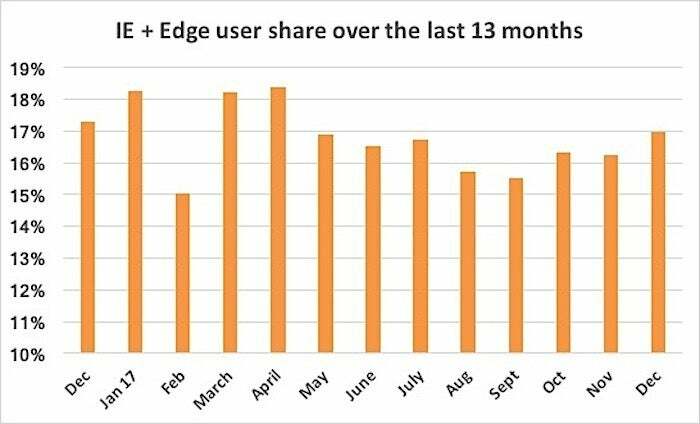 Together, IE and Edge - the default browser for Windows 10 - controlled just 14% of the September global user share, a decline of 1.1 percentage points from the month prior. That 14% figure was a record low for this century. Net Applications calculates user share by detecting the agent strings of the browsers people run to reach the company's clients' sites. The firm tallies the visitor sessions - site visits, essentially, with multiple sessions possible daily - rather than count users, as it once did. Net Applications thus measures activity differently than rival firms that total page views. IE's September slip-and-slide was nothing new: The browser has been in a tailspin since Microsoft announced it would require Windows users to upgrade to the latest version. IE has plummeted 48.5 points, equivalent to a decline of 83%, in the four-plus years since the 2014 announcement that triggered Microsoft's browser disaster. At the current average monthly loss, IE + Edge will drop beneath 13% by December, under 12% by February 2019 and below 10% by next July. While Computerworld's forecasts have at times missed marks, Microsoft's assumed fall is built on some fundamental facts. First and foremost, because IE has received only security updates since January 2016 it has not been refreshed for more than two and a half years. In plainer terms, it's at least that far behind rivals like Chrome and Firefox. Second, Edge has been marginalized - pushed to the edge of irrelevance - on Windows 10. In September, just 10.9% of all Windows 10 users relied on Edge, a half percentage point reduction and another new low for the browser Microsoft hoped would turn the tables. Instead, Google's Chrome became the bully that regularly shook down Microsoft for its user share lunch money. Chrome added a full percentage point of user share last month to reach 66.3%, a record for the cross-platform browser. In the last 12 months, Chrome has gained 6.7 percentage points, the only one among the top four browsers to raise its total during that span. If the trend of the last year continues unabated, Chrome will account for two-thirds of all user share at some point this month. Chrome could account for 70% of the global share as soon as April 2019 and an amazing 75% by January 2020. No current browser can realistically be viewed as a worthy competitor to Chrome. Microsoft's Edge has clearly failed to energize Windows 10 users, Apple's Safari is restricted to the macOS enclave and Mozilla's Firefox teeters on the wire between survival and extinction. Net Applications pegged Firefox's user share change as down more than a tenth of a percentage point. The open-source browser ended September with a 9.6% share, its lowest mark in two years. Calculations using the 12-month average predicted the browser will fall under 9% by December, and below 8% by April 2019. Elsewhere in the September data, Apple's Safari lost less than one-tenth of a percentage point, descending to 3.6%. During September, only 38% of all Mac owners ran Safari as their primary browser. Like Windows users, they have shifted from their operating system's default to a cross-platform alternative, most likely Chrome. Google's Chrome last month continued to creep up on a two-thirds supermajority of browser share, while Microsoft's once-dominant position deteriorated. Again. According to analytics company Net Applications, Chrome's user share climbed half a percentage point in August, reaching 65.2%, an all-time high. In the last 12 months, Chrome has gained 5.9 percentage points, the only browser of the top four - others include Apple's Safari, Microsoft's Edge and Internet Explorer (IE), and Mozilla's Firefox - to add to its total during that period. Net Applications calculates user share by detecting the agent strings of the browsers people use to visit its clients' websites. The firm then tallies the visitor sessions - which are effectively visits to the site, with multiple sessions possible daily - rather than count only users, as it once did. Net Applications primarily measures activity, although it does so differently than rival sources, which total page views. If the trend of the last 12 months continue, Chrome will take the two-thirds prize in November. Barring any change in the browser battle, Chrome will account for 70% of the global share by June 2019. The only other browsers to have accumulated that much share since the web broke out of its academia-government ghetto in the 1990s were Netscape's Navigator and Microsoft's IE. The former faded under assault from the latter, vanishing for good in early 2008; IE is following in its one-time rival's footsteps. Microsoft's combined Edge and IE user share slipped two-tenths of a percentage point last month, falling to 15.2%, another record low this century. During the four years since Microsoft announced it would require Windows users to upgrade to the latest version of IE - in effect, pulling the plug on the still-popular IE8, IE9 and IE 10 - the browser has plummeted 43.3 points, representing a massive decline of 74%. At their current average monthly loss, IE + Edge will drop beneath 14% by November, under 12% by March 2019 and below 10% by next July. While nothing is guaranteed - including Computerworld's forecasting - there are solid reasons why Microsoft's user share will almost certainly keep falling. First, IE has been demoted to legacy status and now receives security updates only; it will be disowned by commercial customers as they migrate to Windows 10 and, more importantly, update and modernize the web apps and websites that force them to support the aged browser. Second, Edge has never taken up the slack. In August, just 11.4% of all Windows 10 users relied on Edge, a drop of one-tenth of a point and another record low for the browser. Elsewhere in Net Applications' data, Mozilla's Firefox picked up nearly one-tenth of a percentage point, clawing back to 9.8%. 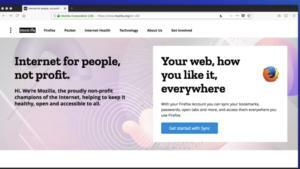 The open-source browser, which Mozilla revamped in late 2017 and aggressively updates with new features in an attempt to stop the losses, continues to have a dim future by Net Applications' numbers. Calculations using the 12-month average change predicte that the browser will dip under 9% by December and keep falling. By May 2019, Firefox could have a scary user share of just 7.9%. Apple's Safari added approximately two-tenths of a percentage point last month to edge up to 3.7%. As of August, 39% of all Mac owners ran Safari as their primary browser, showing that they, too, have largely abandoned their operating system's default browser for cross-platform alternatives like Chrome or Firefox. Net Applications calculates user share by detecting the agent strings of the browsers people use to visit its clients' websites. It then tallies the visitor sessions - which are effectively visits to the site, with multiple sessions possible daily - rather than count only users, as it once did. Net Applications primarily measures activity, although it does so differently than rival sources, which total page views. Microsoft's and Mozilla's browser problems are not new: Both companies have watched their once-substantial user share shrink over the last decade. Microsoft's troubles appeared more dire, as its IE and Edge have shown few signs of stanching their continued losses. With very few exceptions - notably in June, which in hindsight now looks to have been a miscount by Net Applications - IE and Edge have shed share month after month after month. Of the past 24 months, for example, IE and Edge lost share in 19. In the last year, the IE-and-Edge user share dropped by 6.8 percentage points, a 31% decline from the July 31, 2017 mark. Firefox was in a leaky boat, too. July was the third consecutive month in which Mozilla's open-source browser posted a number under the 10% bar. In the past year, Firefox has lost 2.6 percentage points, or 21% of its July 31, 2017, user share. Losses like Microsoft's and Mozilla's are unsustainable. Microsoft's Internet Explorer - Edge was not yet around - had a come-back, too: IE climbed from a December 2011 flirtation with 50% to grow to 59.1% three years later. But IE, and then IE + Edge, have lost ground, first slowly, then more rapidly, since December 2014. In other words, Microsoft's browser slide has been on-going for more than three and a half years, significantly longer than Firefox's nine-month decline. The future of IE and Edge look nearly as ominous if the user share calculation considers their place within the Windows ecosystem, the only platform available to the browsers. According to Net Applications, IE and Edge accounted for 17.4% of the browsers that ran on Windows in July. (The 17.4% was larger than the 15.4% IE and Edge tallied overall because Windows does not power 100% of all PCs; in July, it ran 88.4% of the world's systems.) Darker clouds await, however. IE, already relegated to legacy status, will increasingly be disowned by commercial customers as they adopt Windows 10 and modernize the web apps and websites that now require them to support the old browser. That will leave Edge as the only competitive browser in Microsoft's arsenal. And Edge remains a flop. In July, just 11.5% of all Windows 10 users relied on Edge, a record low for the long-struggling browser. To get an idea of Edge's loose hold on Windows 10, consider that the browser was being used by almost twice the percentage of 10's owners, 20.4%, only 12 months ago. In the zero-sum browser battle, Microsoft's and Mozilla's losses became Google's gains: Chrome added nearly 4 percentage points to its user share in July, ending at 64.7%. The last time a browser owned that large a chunk of the world's browser market was in late 2009, when IE accounted for two-thirds of the total. Calculations by Computerworld now put Chrome on a faster track to that same two-thirds dominance. Using the average monthly change over the past 12 months, Computerworld now expects Chrome to reach 66.7% or more in December and make it to 70% by August 2019. The 12-month average for Microsoft's and Mozilla's browsers paints a different picture. IE and Edge will account for less than 12% of all user share by February 2019, then fall under 10% by May. Firefox will continue its decline as well, slipping below 9% in November and dipping under 8% in March 2019. Elsewhere in Net Applications' data, the user share number for Apple's Safari fell for the third straight month, ending at 3.5%, its lowest since April 2017. Safari's share of all macOS-powered systems also dropped to 38.3% in July, reinforcing Computerworld's analysis last month that being an operating system's default browser no longer guarantees success. The browsers bundled with operating systems, notably Microsoft’s Edge and Apple’s Safari, fell to new lows last month as they continued to lose users, showing that being the default no longer provided a significant advantage. According to California-based analytics vendor Net Applications, Edge’s share of all Windows 10 personal computers and Safari’s share of all Macs dropped to record lows in June. Edge, the default for Microsoft’s newest operating system, was the preferred browser on only 11.8% of all Windows 10 systems. Meanwhile, Safari, the browser packaged with macOS (and before that, OS X), ran on 38.4% of all Mac machines. Net Applications calculates user share by detecting the agent strings of the browsers people use to visit its clients’ websites. It then tallies the visitor sessions — which are effectively visits to the site, with multiple sessions possible daily — rather than count only users, as it once did. Net Applications thus primarily measures activity, although it does so differently than rival metrics sources, which focus on page views. Edge’s popularity among Windows 10 users has been in decline since the OS debuted three years ago. A year ago, for example, Edge was the browser of choice for about 22% of all Windows 10 PC users. Two years ago, that number was about 27%. At first, Edge’s problem was that its user share did not grow at the same pace as Windows 10’s. Even as Edge’s user share of all PCs increased, albeit slowly, its share of all Windows 10 devices fell month after month as the operating system added users in larger numbers than did Edge. The news for Edge got even worse, however, around September 2017, when the browser’s user share (of all PCs) began to fall, reducing its share of all Windows 10 machines even more. There’s no other way to put it: Edge is a flop. In the face of some significant barriers put up by Microsoft — among them a multistep process to change Windows 10’s browser default — users have clearly rejected the browser. If all users of Windows 10 were represented by, say, a baseball team, only one of the nine players would be browsing with Edge. It’s impossible to tell from publicly available data such as Net Applications’ what browser is the most popular on Windows 10 — Edge’s share can be calculated because it runs solely on Windows 10 — but the most likely suspect is Chrome. Google’s browser lost 2.1 percentage points of user share in June, falling to 60.7%. But it remained the No. 1 personal computer browser on the planet by a huge margin: Second-place was held by the effectively obsolete Internet Explorer (IE), with a user share of 15%. Apple’s Safari has traced a track similar to Edge’s over the past two and a half years. At the start of 2016, Safari was the preferred browser for about two-thirds of all Mac owners, a fraction that had been remarkably stable for some time. Within a year, Safari’s hold on Macs had weakened to the point where it barely held on to half of all machines. By January 2018, its share of all Macs had dropped to 43%. June was the first time that Safari’s share of all Macs slipped under 40%, posting just over 38%. As with Edge, it is impossible to know which browser or browsers replaced Safari for those Mac owners who ditched Apple’s. Chrome is the likeliest replacement because of its massive user share, but other possibilities include Mozilla’s Firefox and lower-tier browsers such as Opera Software’s Opera. Safari’s inability to hold on to the Mac based on its default status is also more puzzling than Edge’s. Microsoft’s browsers began their decline when the company forced Windows users to upgrade to the most recent version of IE and terminated some versions’ support early. The mandate kicked in in January 2016. But by opening the door to change, Microsoft triggered a massive user desertion. As millions of users and businesses were told they had to switch browsers, they instead used the opportunity to abandon Microsoft’s and install rivals’, notably Chrome. Although IE lost significant share — about 11 percentage points — in the 12 months before the deadline (Microsoft had first told customers of the new policy in August 2014), IE shed twice as much, around 22 points, in the 12 months after the mandated move. Apple never demanded anything similar of its Mac users and continued to support Safari for the current version of macOS and the two previous versions. One theory is that as Chrome replaced IE on users’ at-work Windows PCs, people followed suit on their at-home Macs, so they could, for instance, synchronize data such as passwords and bookmarks. In companies that supported both PCs and Macs, the Microsoft order may have sparked a similar shift from IE to Chrome, with Macs also adopting Google’s browser as those firms turned toward browser homogeneity. Elsewhere in Net Applications’ data, the user share numbers reported that Firefox, which slipped under the 10% bar in April, remained stable in June at the same 9.9%. Mozilla's Firefox landed on a slippery slope last month and may face a slow demise as users desert the browser for Google's Chrome. According to California-based analytics vendor Net Applications, Firefox lost a quarter of a percentage point of user share in May, ending the month at 9.9%. It was the first time Firefox has fallen below the 10% marker since November 2016. Net Applications calculates user share by detecting the agent strings of the browsers people use to visit its clients' websites. It then tallies the visitor sessions — which are effectively visits to the site, with multiple sessions possible daily — rather than count only users, as it once did. Net Applications thus measures activity most of all, although differently than rival metrics sources that focus on page views. Eight years ago, Firefox accounted for more than a quarter of the globe's browser share. That's fallen to less than a tenth. More importantly, the trend for Firefox looks ugly. If the six-month average holds, Firefox will drop below 9% by September, then slide under 8% by January 2019. While Mozilla may have access to different data — it should know, for instance, whether the active-user count is up or down — Net Applications' numbers must be tough to swallow. The company has poured time and resources into revamping Firefox, which produced "Quantum" late last year. But the redesign failed to stop the browser's drip-drip-drip of user share. Other browsers also got bad news in May. Microsoft's browsers — Internet Explorer (IE) and Edge — shed seven-tenths of a percentage point last month, accounting for 16.1% of all visitor sessions worldwide. The decline erased two consecutive months of gains by IE and Edge. Like Firefox, IE and Edge are on a downward line; the six-month trend forecasts that they will dip below 16% by September. That number will fall even more as the months tick by, and more enterprises discard Windows 7 for Windows 10. IE has been downgraded to a legacy application — suitable for running older web apps and sites, though with all but maintenance servicing abandoned — and as corporations revamp their apps, the need for it will vanish. And Edge has simply been a flop: In May, only about one in eight Windows 10 users ran the browser, a record low in its three-year history. Even Apple's Safari took a hit. The default Mac browser lost three-tenths of a percentage point to finish at 3.7%, the lowest number in nearly a year. And Apple's "Chrome Disease" continued to progress, with no cure in sight, as just 41% of Mac users relied on Safari in May. The bulk of the rest had almost certainly deserted Apple for Google and its Chrome browser. Chrome, in fact, gained an impressive 1.2 percentage points in May, the largest one-month increase since January 2017. The additional user share pushed Chrome to 62.8%, closing in on two of every three desktop and laptop browsers. 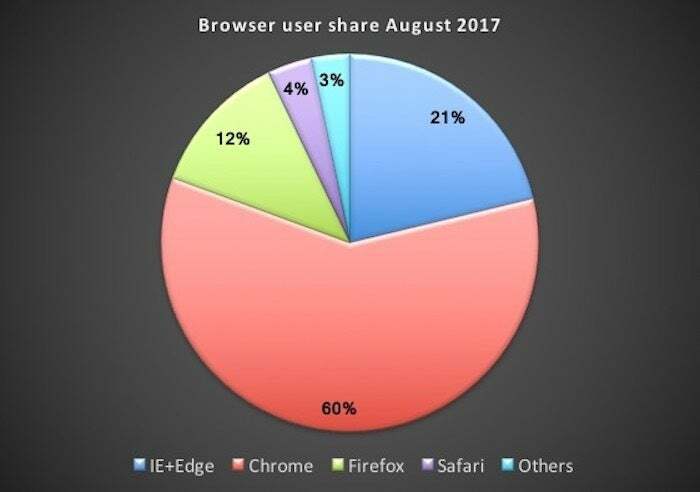 The last time a browser had such a dominating position was more than eight years ago, when IE accounted for 63.2% of all user share. If the six-month trend holds true, Chrome should pass the 64% milestone sometime in September, and zip above 65% before New Year's Day. Microsoft's browsers have scratched out user share gains in three of the last five months, halting what late last year looked like a death spiral. Less than half of the half-a-percentage point increase since November has come from Edge, the Windows 10 browser Microsoft has bet on for the foreseeable future. According to data published Tuesday by California-based analytics vendor Net Applications, Microsoft's Edge and Internet Explorer (IE) combined to account for 16.8% of the browser market during April. The one-tenth of a point increase over March was near the browsers' five-month average. The rosier outlook for Microsoft's browsers stood in contrast to earlier forecasts based on Net Applications' numbers. The reason for the change: The metrics company again went back into its data, this time for February, and revised its numbers after expelling bot traffic. As it did in November, Net Applications purged the bot traffic because it skews results. These software-based tools are usually deployed by criminals and hucksters, who program the bots' automated scripts to mimic human online behavior, often for ad click fraud purposes. "Bots can cause significant skewing of data," Net Applications explained last year. "We have seen situations where traffic from certain large countries is almost completely bot traffic. In other countries, ad fraudsters generate traffic that spoofs certain technologies in order to generate high-value clicks. Or, they heavily favor a particular browser or platform." The revised data put Microsoft's browsers in a slightly better light, with increases to both Edge and IE since November's retuning. There's little indication that either browser actually grew its user share - as opposed to the bot scouring causing the gains - because both Edge and IE added to their share. As a second-class browser since Microsoft relegated it to legacy support duties, IE is unlikely to climb in user share. Of Microsoft's two browsers, Edge was responsible for just under half - 48% - of the November-to-April increase; IE accounted for the remaining 52%. Mozilla's Firefox did not benefit from Net Applications' latest bot cleansing, as it again shed share in April, losing four-tenths of a percentage point to end at 10.2%. That was after March's decline of six-tenths of a point to 10.5%. As Computerworld has pointed out several times since Mozilla launched a revamped Firefox labeled "Quantum," the redesign and associated attention has failed to stop the browser's long bleeding of user share. In the five months since Quantum's debut, Firefox has lost 1.3 percentage points, which represented 11% of its end-of-November share. If the trend over the past five months continues, Firefox will slip under the 10% user share bar this month, and fall below 9% by September. Meanwhile, the user share of Google's Chrome and Apple's Safari fell and climbed, respectively, last month. Chrome lost almost a tenth of a percentage point, slipping to 61.7%, while Safari scratched out another half of one-tenth of a point to make an even 4%. However, Safari continued to lose ground where it counts, on Apple's Mac systems. Like Microsoft, Apple has been laid low by "Chrome Disease," as more of its Mac owners have deserted the company's own browser (Safari) for an alternative (almost certainly Chrome for the most part). Although Safari was the browser of choice for as much as two-thirds of those running OS X (the former name for macOS), Safari slipped into the minority on Apple machines in December. Last month, Safari was the primary browser on just 43% of all Macs. Net Applications calculates user share by detecting the agent strings of the browsers people use to visit its clients' websites. It then tallies the visitor sessions - which are effectively visits to the site, with multiple sessions possible daily - rather than count only users, as it once did. Net Applications thus tracks both users as well as their activity, where rivals analytics sources focus solely on the later. The company also accounts for the size of each country's online population to better estimate share in regions where it lacks analytics customers, such as China and India. Mozilla's radical overhaul of its financial cornerstone, Firefox, has so far failed in its primary mission, to stop the slide in browser share, new data published Sunday showed. According to new numbers from California-based analytics vendor Net Applications, Firefox lost six-tenths of a percentage point of user share in March. That was the largest decline in almost two years, excepting November 2017, when Net Applications revamped its tallies by eliminating fraudulent bot traffic from its data. For March, Firefox's user share — an estimate of the portion of the world's PC owners who ran the browser in a given period — was 10.3%, the lowest since a near-death experience in the summer of 2016, when it plunged to below 8%. At one point — April 2010, to be specific — Firefox accounted for more than a quarter of the globe's browser share. More distressing to Mozilla, Firefox's user share has fallen rather than climbed since the November launch of Quantum, a.k.a. version 57, which the company trumpeted as the "biggest update" since Firefox 1.0 in 2004. Quantum boasted major speed improvements, a redesigned UI (user interface) and a switch to a new add-on framework that necessitated rewrites of all legacy extensions. In the four months since Quantum's debut, Firefox has shed 1.1 percentage points, which represented more than a tenth of its end-of-November user share. Only in one of those four months did Firefox add share, and then only a tenth of a percentage point. If Mozilla cannot stem that user-share bleeding, its financial future may be at risk; in 2016, the most recent year for which figures are available, royalties from Mozilla's search deals — to make search engine Z or Y the default of the browser — accounted for a whopping 91% of its total income. If the browser continues to shed users, search firms such as Google, the current default for the browser in many regions, will have less reason to pay for the privilege. Firefox's immediate future may be rough: If the trend of the last four months continues, the browser will drop under the 10% bar sometime in May, and under 9% in August. That's not certain of course — Firefox has clawed out of user share holes before, if only temporarily — but the overall trend has been downward. Apple's Safari also lost substantial user share last month, casting aside four-tenths of a percentage point to end March with 3.9%. The decline was the first for the year. But Apple has suffered, like its operating system rival Microsoft, from "Chrome Disease." Safari has, just as has Internet Explorer, lost its once-majority position on its native OS, ceding share to Google's Chrome browser. Where once Safari was the browser of choice for as much as two-thirds of those running OS X (the former name for what Apple now calls "macOS"), since late last year, Safari has slipped below the 50% mark on Apple machines. During March, for example, Safari was the primary browser on 46% of all Macs. The obvious beneficiary of Safari's decline? Chrome. While it's impossible to prove that's the case with Net Applications' public data, the increase in Chrome's user share over the last two years — it was the only browser to continuously grow share during that period — points to it, not to the other cross-platform choice, Firefox. The remaining major browsers — Microsoft's Internet Explorer (IE) and Edge, and Google's Chrome — gained share last month. Microsoft's IE and Edge combined to post a user share of 17.9%, a month-over-month increase of about half a percentage point. That was the third boost to IE+Edge since Net Applications markedly downgraded their numbers in November when it scrubbed bot traffic from its data. But as Computerworld pointed out a month ago, Microsoft will soon face an Edge-only world that may have a huge impact on its position in the browser battle. Already labeled a legacy browser for Windows 10, where it's relegated to rendering stagnant enterprise intranet pages and can't-be-or-won't-be upgraded apps, IE will fall off Windows 7's support when that OS gets its walking papers in January 2020. Users will still be able to run IE on Windows 10, but that's likely to be an increasingly smaller number as corporations revamp their online sites and apps to accommodate more modern browsers. There's little evidence that that modern browser will be Edge: Microsoft's newest ran on just 13.2% of all Windows 10 personal computers last month, according to Net Applications. Although the number was one-and-a-half percentage points higher than February's, the truth is that Edge has been on a decline since its introduction, when it was the first choice of nearly 40% of all Windows 10 users. When Edge becomes Microsoft's sole browser, more or less, there is a very good chance that the Redmond, Wash., developer will account for a share in the single digits. Even if Windows 10's PC penetration doubled, Edge would, by March's figure, be the browser on fewer than 9% of the world's personal computers. Chrome also accumulated more user share last month, gaining three-tenths of a percentage point to rack up a record 60.9%. At its 12-month growth trend, Chrome should crack 62% by September and 63% by early 2019. Net Applications calculates user share by detecting the agent strings of the browsers people use to visit its clients' websites. It then tallies the various browsers, accounting for the size of each country's online population to better estimate share in regions where it lacks large numbers of analytics customers. Microsoft is less than two years away from becoming a browser afterthought, according to the newest data from analytics vendor Net Applications. Data published Thursday by the California-based company showed that the user share of Internet Explorer (IE) stood at 13.5% for February. That was an impressive 1.7 percentage point increase from the month prior and the highest, by far, since Net Applications revamped its tallies by eliminating bot-made traffic from the data. Even that increase was but a temporary reprieve from a depressing-to-Microsoft trend that has seen the browser shed an enormous amount of user share in the past several years. As recently as June 2015, before Microsoft launched Windows 10 and thus that OS's native browser, Edge, IE accounted for 54% of the world's browsers, and nearly 60% of those that ran on a Windows-powered personal computer. Last month, IE's user share among all Windows-based PCs stood at 15.4%, meaning that fewer than one in every six Windows machines relied on IE to access the Internet. Even worse for Microsoft, IE is on borrowed time. Already designated as a legacy browser in Windows 10, where it's been relegated by enterprises to rendering stagnant internal websites and can't-or-won't-be upgraded web apps, IE will be dropped from support on Windows 7 when that OS gets its retirement papers in January 2020. Users will still be able to run IE - and Windows 7 for that matter - after that month, but they will assume significant risk because neither the browser or the operating system will receive security updates. Because IE accounted for more than three-fourths of the combined user share of both Microsoft browsers, and what with Edge's tenuous foothold on Windows 10, Microsoft faces a dramatic decline in its total user share when IE is put to pasture. By the time Microsoft retires Windows 7, and for effective purposes, IE as well, Windows 10 should have reached a user share (of all Windows) of around 63.6%, assuming its climb continues on the past year's trend line. If Edge hasn't, well, edged up as a share of all Windows 10 by that time - and all evidence is that it will not - then Microsoft's active browser share will be in the single digits, perhaps as low as 6%. As a comparison, Edge's predicted 6% in 2020 would be only slightly more than half the share that Mozilla's Firefox - another browser that has been, and is once again, on the ropes - now holds. Other browsers' February results were mixed. Google's Chrome, while still the big dog, shed eight-tenths of a percentage point last month, falling to 60.6% and upending Computerworld's forecast that the browser would soon top the two-thirds mark. Firefox ran to stay in place, ending February with a user share of 10.9%, while Apple's Safari, always a single-digit browser on the desktop, picked up a tenth of a percentage point to reach 4.3%. Apple, like Microsoft, has seen its primary browser lose share on its home turf. In February, approximately 44% of all Macs ran Safari as the main browser, down from a dominant 66% less than three years ago. Chrome has probably claimed the bulk of the Safari deserters, just as it has absorbed those Windows users who abandoned IE in the same period. Net Applications calculates user share by detecting the browser agent strings of the applications people use to visit its clients' websites. It then tallies the various browsers, accounting for the size of each country's online population to better estimate share in regions where it lacks large numbers of analytics customers. Browsers built by Microsoft and Mozilla jettisoned some of their precious user share in January, while Google's broke out of a months-long malaise by grabbing what its rivals lost, and then some. According to California-based analytics vendor Net Applications, the user share of Internet Explorer (IE) and Edge - the estimated portion of all personal computer owners who ran those browsers - fell by half a percentage point to 16.5% in January. After a one-month reprieve from losses - IE+Edge had climbed in December - Microsoft's browsers returned to their long-time pattern of decline. The 16.5% mark was the second-lowest for Microsoft's combined user share in the decade that Computerworld has recorded Net Applications' numbers. Together, the two browsers ran on about 19% of all Windows PCs, or on slightly less than one in five systems. That was the lowest-ever share of Windows PCs for the pair and stood in stark contrast to the 52% they accounted for just two years ago. January 2016 was a red-letter month for IE because it was then that Microsoft stopped serving security updates to most editions of its kingpin browser, forcing customers to upgrade in most instances to IE11. Many instead switched browsers. It was Microsoft's decision to retire non-IE11 editions that fueled the rise of Google's Chrome. And Edge, the default browser for Windows 10, has not taken up IE's slack by any measure. Edge's own user share - less than 5% - meant that the browser ran on fewer than 14% of all Windows 10 machines in January, or less than one in every seven devices powered by the OS. If IE's collapse has been Microsoft's biggest browser defeat, then the inability of Edge to capture more than a piddling part of the Windows 10 audience has been the company's second-largest failure. Simply put, Windows 10 users have rejected Edge. Meanwhile, Mozilla's Firefox shed two-tenths of a percentage point, ending the month at 10.85%, that browser's lowest share since September 2016. The November overhaul, on which Mozilla has pinned great hope, has yet to boost the browser's user share, even though reviews of what the company calls "Firefox Quantum" have generally been upbeat. Because browser user share is a classic zero-sum exercise - if one browser loses part of the available 100%, one or more others must gain - it was no surprise that Chrome picked up eight-tenths of a percentage point in January, the largest increase since the same month of 2017. Chrome accounted for 61.4% of last month's user share, according to Net Applications. Chrome has been the biggest recipient, by far, of the dual decline of Microsoft's IE and Mozilla's Firefox. Google's browser is within striking distance of accounting for two-thirds of the world's user share, a mark it could reach by November based on trends over the last quarter. The same trend line now forecasts that IE+Edge, as well as Firefox, will head in the other direction. Computerworld calculated that IE+Edge could slip below the 10% bar as soon as August, while Firefox will beat it there, with a shot at dropping under 10% in March. Net Applications calculates user share by detecting the browser agent strings of those who visit its clients' websites. It then tallies the various browsers, accounting for the size of each country's online population to better estimate share in regions where it lacks large numbers of analytics customers. Other data sources painted a picture that resembles Net Applications'. Irish metrics company StatCounter pegged IE+Edge's January decline at a half percentage point to 11.4%, and a Firefox slide of four-tenths of a point, to 11.9%. Chrome, on the other hand, added 1.3 percentage points to its usage share - a different measurement than Net Applications' user share, and akin to activity - ending January with a remarkable 66%. The user share of IE+Edge slipped in January, a return to the norm for Microsoft, which has seen its rule of the browser world overturned by a Chrome coup. Microsoft's browsers in December recouped some of the user share they'd sloughed off in November when an analytics vendor changed how it portrays the battle for online hearts and minds. According to Net Applications of Aliso Viejo, Calif., the user share of Internet Explorer (IE) and Edge - an estimate of the fraction of the world's personal computer owners who ran those browsers - bumped up seven-tenths of a percentage point to end 2017 at 17%. Although the uptick recovered only a fifth of the massive loss from the month prior, when Net Applications scrubbed fraudulent bots from its data, Microsoft was likely pleased with even that small bit of good news about its browsers. IE and Edge, the former in particular, have been on an extended slide for several years. The bot-free traffic of Net Applications pegged the total of 2017's IE+Edge downturn at just 1.3%, a loss of only three-tenths of a point. December's boost was a big reason for the relatively small decline during last year. In Net Applications' numbers, Firefox remained the third-place browser, with a 11% user share, down four-tenths of a percentage point from November. Firefox, whose maker recently overhauled the browser, also took it on the chin when Net Applications scratched out bot traffic. In the new, cleansed data, Firefox's user share dropped 3.5 points in 2017, representing a 24% decline. That was the largest decrease among the world's top browsers. Chrome led the pack in December with a user share of 60.6%, virtually the same as in November, while Apple's Safari climbed two-tenths of a percentage point to 4%. IE+Edge's improving number also affected another important data point: The percentage of Windows 10 users who rely on Edge ticked up slightly in December to 14%, an eight-tenths of a point increase. The gain put Edge's share on all Windows 10 PCs at the highest mark since July 2017. Add IE, and Microsoft's browsers ran on a combined 19.1% of all Windows PCs in December, also an increase from the month before. But under the best circumstances, it will take months for IE+Edge to establish a clear trend of growth. Of course, the Net Applications numbers for December may have been just a fluke, a blip on the data radar. Microsoft's browsers have seemed to stabilize after extended periods of decline in the past, for instance, only to resume their slide toward obscurity. 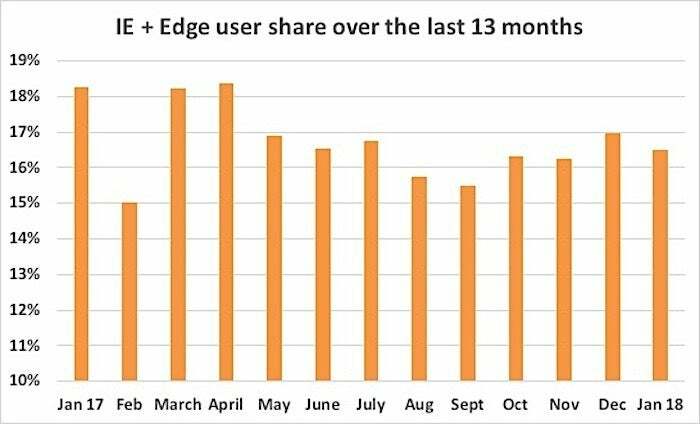 The user share of IE+Edge ticked up slightly in December 2017, a welcome sign to Microsoft, which has watched its lead evaporate over the last two years. Microsoft's Internet Explorer (IE) and Edge browsers tumbled last month in user share as the once-universal programs ran on just one in every six personal computers worldwide. 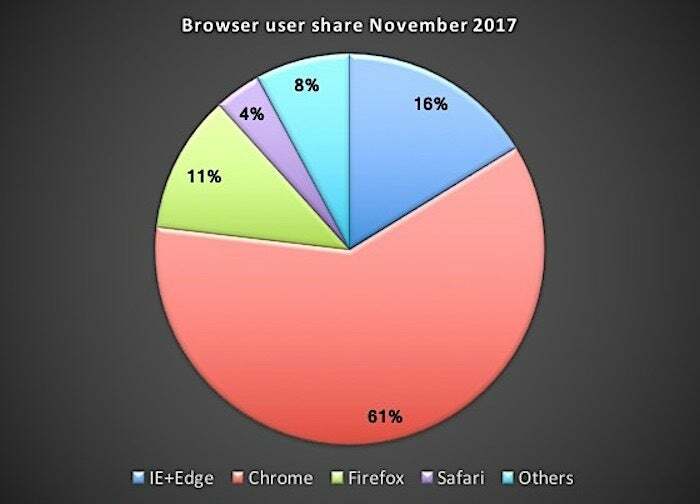 According to U.S. analytics vendor Net Applications, the user share of IE and Edge - an estimate of the world's personal computer owners who ran that browser - plummeted by 3.3 percentage points to end November at 16.3%. The decline was the largest ever for Microsoft's browsers. Mozilla's Firefox also stumbled badly last month, losing nearly 2 of its hard-won percentage points, slipping to 11.4%, its lowest user share since October 2016. These numbers, and more importantly the fact that IE+Edge's and Firefox's numbers sank to such a degree, is striking. But it was as much a data reset by Net Applications as proof of massive user desertions. As it has periodically, Net Applications has reworked how it tracks browsers, operating systems and other metrics of interest to online businesses. In a message appended to a refreshed analytics display, Net Applications explained that it had rewritten its "entire collection and aggregation infrastructure to address" out-of-whack data. The culprit? Bots, said Net Applications. These software-based tools often are deployed by criminals, who program their automated scripts to mimic human online behavior, perhaps in an attempt to cash in on an ad click fraud scam. "Bots can cause significant skewing of data," admitted Net Applications. "We have seen situations where traffic from certain large countries is almost completely bot traffic. In other countries, ad fraudsters generate traffic that spoofs certain technologies in order to generate high-value clicks. Or, they heavily favor a particular browser or platform." While some may want to blame the large shifts in browser user share on Net Applications' scouring its data of bot traffic, that would be the wrong move. "Please note: This dataset is separate from and replaces the legacy data," the company said, making clear that it had gone back into past data too, not just November's, and eradicated the numbers it ascribed to bots. Assuming that the new methodology cleaned out all or most of the dodgy bot-driven traffic from Net Application's data, the bottom line is that the numbers now portray IE+Edge, and to a lesser extent, Firefox, in less flattering lights. Microsoft's browsers have deteriorated to a point unthinkable just two years ago, when they ran on more than half the world's personal computers. And Firefox's climb back from a near-death experience in 2016 has not been as impressive as the data once showed. Also of interest were the new data points for Edge and IE calculated against only Windows personal computers. Because both browsers run only on Windows devices, it has been possible to surmise their share on that platform alone. Of all Windows 10 users, just 13.2%, a record low, ran Edge in November (Edge only runs on Windows 10). As recently as March, Edge's share of Windows 10 had been around 22%. IE's share of 18.4% of all Windows PCs was slightly better than Edge's, but like its successor, IE's November mark was an all-time low. At the start of 2016, IE's Windows-only share was a more respectable 28.5%. Bottom line: Net Applications' scrubbed data painted a picture of Windows 10 users shunning Edge, and IE users renouncing the browser in record numbers. Apple's Safari also shed user share last month, sliding six-tenths of a percentage point to 3.9%. Meanwhile, the king of the hill, Google's Chrome, ended November with a user share of 60.6%, up about eight-tenths of a point. It was the first time that Chrome broke the 60% tape in Net Applications' tracking. Because browser share is a zero-sum game, the downgrading of Microsoft's, Mozilla's and Apple's browsers meant others experienced growth. In Net Applications' case, the cleaned-up data and revised website listed a slew of previously-unreported browsers, including several popular outside the U.S. Among those were QQ, the browser created by Tencent, China's largest web company (with a user share of 1.8%) and Yandex, which belongs to the same-named Russian search firm (0.6%). Others now on Net Applications' list ranged from Opera (1.4%) to Vivaldi (0.1%). Microsoft's browsers — Internet Explorer and Edge — were used by just 16% of the world's online users of personal computers last month, or on about one in every six systems. The once mighty Microsoft could soon be eclipsed by Mozilla and that open-source developer's Firefox. Microsoft's Edge last month sank to its lowest-ever user share, with less than 16% of Windows 10 users running the browser during October. According to U.S. analytics vendor Net Applications, the user share of Edge — an estimate of the world's personal computer owners who ran that browser — fell by six-tenths of a percentage point, ending October at 4.6%. The decline was the largest ever for Edge, and set the browser back to the user share spot it last occupied in April 2016. More notable was Edge's usage when calculated as a percentage of Windows 10. (Edge is the default browser for Microsoft's OS; likewise, Edge only runs on Windows 10.) Of all Windows 10 users, just 15.7%, a record low, ran Edge in October. As recently as March, Edge's share of Windows 10 had been around 22%. Edge's share of Windows 10, which started off at 36% when the operating system debuted, has steadily fallen since then, wrapping up 2015 at 28% and ending 2016 at 22%. If every Windows 10 user had stuck with Edge, the browser would now have a user share of 29.3%, or more than six times its mark. Instead, the trend line has shown that the more PCs that run Windows 10, the poorer Edge has performed. Simply put, Edge never caught on among Windows 10 users. And at this point, it may be in an unrecoverable position. It's hard to envision a strategy that would successfully coax significant numbers to Edge unless Microsoft were willing to take such desperate measures - like barring all other browsers from the OS - that it would invite regulatory intervention. A user share increase by Internet Explorer (IE) more than compensated for the decline in Edge, with the combined figure for the two edging up by three-tenths of a point to 19.7%. The boost was the first positive move by Microsoft's browsers since December 2014. Short-term user share changes are often inscrutable, but the three-tenths of a percentage point increase of IE+Edge could be a partial recovery in data collection sanity after the stunning 1.9-point plummet in September. The next month or two will either confirm that that month's free-fall was real or contest its accuracy. Because browser share is a zero-sum game, Microsoft's uptick meant someone had to face shrinkage. Apple's Safari took the brunt, falling by 0.7 of a percentage points to 4.4%. Mozilla's Firefox and Google's Chrome added 0.3 of a point and 0.2 of a point, respectively, stretching to 13.1% and 59.8%. For Firefox, the October mark was its highest in three years. Meanwhile, Chrome continued to sneak up on 60% but again failed to top that bar. At the pace of the last six months, Chrome should pass, albeit barely, 60% by year's end. Microsoft's browsers suffered another big setback last month, losing so much user share that they fell beneath the 20% bar. According to U.S. analytics vendor Net Applications, the user share of Internet Explorer (IE) and Edge — an estimate of the world's personal computer owners who ran those browsers — plummeted by 1.9 percentage points, ending at a combined 19.3%. The downturn was the largest since October 2016. September's decline was previewed the previous month, when IE+Edge lost nearly a full percentage point after a five-month stretch when the browsers' slump had been relatively small. Most notable was that the browsers' combined share dropped below 20%, a milestone of sorts, albeit a negative one, in their decline, which began in earnest a year and a half ago. It was then that Microsoft forced Windows users to upgrade to the latest version of Internet Explorer supported by their version of Windows — which meant IE11 for most users — or run Edge on Windows 10. Nor has Edge taken up enough of the slack as IE's share has plunged. Last month, Edge ran on a record-low 17.7% of Windows 10 personal computers. Edge's share has diminished since Windows 10's debut — it accounted for 39% of all Windows 10 in mid-2015 — even as the operating system's share has grown dramatically. If every Windows 10 user had stuck with Edge, the OS's default browser, Edge would have a user share of 29.1%, or more than five times its actual mark. Instead, the more PC owners who run Windows 10, the poorer Edge has performed. To Computerworld, that signals an irredeemable loss for Microsoft; it's unlikely the firm will be able to coax customers to return Edge to pride of place on Windows 10. Since browser share is a zero-sum game, Microsoft's loss meant rivals won. Apple's Safari climbed by 1.2 percentage points to 5.1%, its highest mark in more than two years, and Mozilla's Firefox added six-tenths of a percentage point, climbing to 12.9%, the largest share that browser has enjoyed in nearly three years. And Chrome edged up three-tenths of a point to 59.6%, ending a three-month slowdown in growth. Net Applications estimates user share by sniffing the browser agent strings of those who visit its clients' websites, then tallying the various browsers and operating systems. It also weights each country's data by the size of its online population to account for locations, like China, where it lacks large numbers of analytics customers. That was the sound Microsoft's browsers made last month as they leaked user share. Yet again. According to U.S. analytics vendor Net Applications, the user share of Internet Explorer (IE) and Edge -- an estimate of the world's personal computer owners who ran those browsers -- slid by nine-tenths of a percentage point, ending at a combined 22.2%. The August decline was the largest since January. It can be difficult to accurately spot short-term trends with Net Applications' data: At times, changes seem more an artifact of the company's methodology. IE+Edge's latest plunge may signal a renewal of losses after a five-month slow-down in the desertion rate, or it could be simply a hiccup. Overall, however, Microsoft's fortunes remain dark in the browser race. While the share loss in the eight months of 2017 has been just over half that of same period of 2016 -- illustrating a slowing of the bleeding -- IE+Edge has shed almost a full percentage point each month so far this year. If that reduction rate keeps up, the browsers will vanish before this time in 2019. Even so, Microsoft must stare at browser share reports and wonder when the bad news will end. And where IE and Edge will end up as well. IE, of course, has been pushed aside by Microsoft, which has assigned it legacy status, with a concomitant no-further-development policy. Internet Explorer will live on, in the form of IE11, even after the retirement of Windows 7 in early 2020, but Microsoft has already dug the browser's grave, if not dropped it in. Microsoft's bigger problem is the lack of enthusiasm for Edge, the default browser in Windows 10, the forever OS that may never expire. 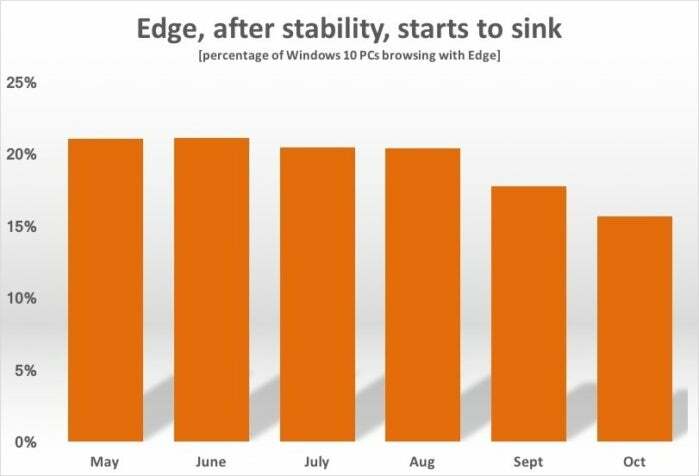 During August, just 20% of all Windows 10 users ran Edge as their primary browser. 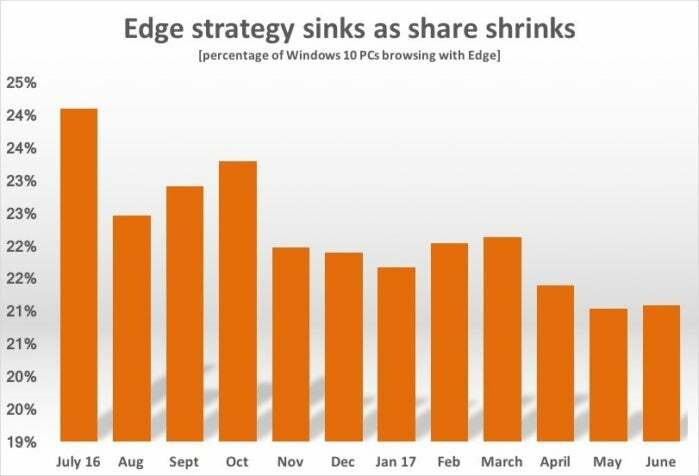 Edge's share has headed downhill since the operating system's mid-2015 debut - when it accounted for 39% of all Windows 10 - even as the latter's share has grown leaps and bounds. The more people run Windows 10, the less they collectively like Edge. That's not a good sign for the browser's future. Because the struggle for share is zero-sum, Microsoft's loss again meant a win for some rivals. Apple's Safari climbed by two-tenths of a percentage point to 3.9%, and Mozilla's Firefox stayed in place, while the generic "Others" category grew by nearly a full point, largely fueled by a big bump in what Net Applications dubbed "Proprietary or Undetectable" browsers. Google's Chrome, which has taken in most of the IE+Edge refugees, fell by two-tenths of a percentage point in August, ending at 59.4%, or back at the number it held in May. IE's and Edge's declines accelerated again in August, dropping nearly a full percentage point. Whatever Microsoft is going to do to save its browsers, it better do it fast. Microsoft has to take solace from any source it can as its share of the browser market continues to dribble down the drain. To wit: Even as Microsoft's browser share again declined during July, at least it was a smaller contraction than of late, perhaps giving those in Redmond hope that the worst is behind them and at some point the downward lines on their charts will flatten. According to data from U.S. analytics vendor Net Applications, the user share of Internet Explorer (IE) and Edge -- an estimate of the proportion of the world's personal computer owners that ran those browsers -- dipped by three-tenths of a percentage point, ending at a combined 22.2%. July's loss was the smallest since March, and the second smallest since December 2014. At times, browser share data is too fickle for illustrating short-range trends, so the five-month slow-down in IE+Edge declines could be an artifact of the metrics company's methodology. Or it may be the strongest signal yet that Microsoft's browsers may have a share basement beyond which they won't sink. Exhibit A for the latter: For the first seven months of this year, IE+Edge lost four percentage points, representing a 15% reduction from their Jan. 1 state. Compare that to 2016, when in the same length of time, IE+Edge bled nearly 14 percentage points, equal to a decline of 29%, or more than twice as much as 2017. Microsoft must get its victories, or even less-drastic defeats, where it can. Not surprisingly, the slowing of Microsoft's browser share deterioration was tempered by a continuation of a troubling trend for Edge, the default in Windows 10. Last month, just 20% of all Windows 10 users ran Edge as their primary browser, down from 24% a year earlier. Edge's one-in-five share of Windows 10 is the browser's lowest ever showing. Because the share skirmish is zero-sum, Microsoft's losses translated into rival browser makers' gains. When the former slides less, competitors' growth does as well. Most affected was Google's Chrome, which has been the biggest beneficiary of IE+Edge's nosedive. Chrome remained virtually flat last month, increasing its share by just one-tenth of a percentage point to post 59.8% for July. Since the start of the year, Chrome has climbed by three points, representing a 6% growth rate. In the first seven months of 2016, Chrome added nearly 19 points to its share, equal to a hike of 58%. Mozilla's Firefox was the winner for July, putting another three-tenths of a percentage point on its share to reach 12.3%, the browser's highest number in almost three years. Although Firefox currently controls less than half the share it did at its late 2009-early 2010 peak, its recovery from a near-death experience a year ago has been remarkable. In August 2016, Firefox slumped to 7.7% and seemed in danger of vanishing altogether. IE's and Edge's declines slowed, as did Chrome's gains during July, leaving Google's browser on the verge of grabbing two-thirds of the global browser share. Microsoft's browsers in June 2017 continued their free fall, again shedding a significant amount of user share, an analytics company reported today. Microsoft has pinned great hopes on Edge, its latest browser, but nearly two years after its launch, just one in five Windows 10 users run it.